Charity Yardsale. When buying a new place people have different preferences. Some people insist of buying an empty place so they could arrange it as they wish while for other people it is very important the place to have the basic furnishings. The second group of people besides the desired location and the layout of the rooms in the apartments, take care of the setup of furnishing in the house. They look for a place that will be arranged as they want so they won’t spend so much time looking for different objects. Stacy and Marvin are a young married couple. They have just moved into their new house where they found complete furnishings. For them the furnishing wasn’t the most important thing about the house but they decided to take it anyway. However, very soon they realized that most of the objects including the furniture they’ve found in the house are not needed for them. That’s why they decided to organize a yard sale. Since they don’t have an intention to become richer with someone else’s objects, they like to donate all the money they will get for humanitarian purposes. Let’s help Stacy and Marvin in organizing the charity yard sale. With this yard sale they will make many people happy by selling them objects at a cheaper price, not to mention the humanitarian aspect of the whole sale that will bring goods to someone who really needs. 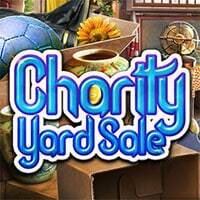 Charity Yardsale is a free online hidden object game on Hidden4Fun.